In the last issue of Spit Happens I briefly mentioned ISO Glasses. After that post I received a few questions about ISO Glasses. Mainly asking what they are and why you would need them. I guess being around wine educators and students so much made me ignorant of the fact that not everyone knows what they are. International Standards Organisation or ISO wine glasses are recognized internationally as the standard design for tasting and sensory evaluation for wine professionals and education. They are highly unlikely to break. Exceptionally clear and dishwasher safe ( this is super useful since wine classes will often use 8 to 10 stems per student per class). The glasses are manufactured to exacting standards for height diameter and volume. In my view they also make a perfectly designed glass for travel if you are visiting fellow wine nerds for an evening of study ( yes I call it study) . 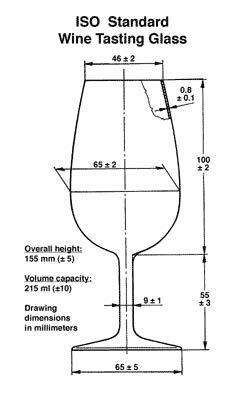 The small volume in the ISO glass means the ratio of liquid to air can be maintained with a smaller portion of wine. This in turn allows more samples of wine per bottle. Class size is usually determined by tastes per 750ml bottle. In my experience the usage of an ISO is limited to trade tastings , educational settings and vertical tastings ( when you are tasting multiple vintages from the same producer). With a larger sample of wine in the glass it’s utility is lessened as it’s more likely to spill. The glass is also pretty good at highlighting flaws like oxidation or TCA ( cork taint). I have had some success with smaller portions of port and sherry from the glass. 60 to 70 ml has been the range best used.